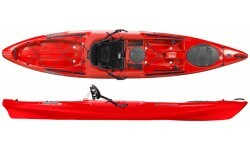 Wilderness Systems Kayaks offer a suberb range of high quality sit on top kayaks. The Tarpon range are considered to be one of the best Sit On Top Kayaks available in the world. Very popular compact sit on top, very stable and easy to paddle on the sea, inland rivers & canals. Great for coastal & inland touring. Available in a fishing specification. A longer, faster kayak offering great speed for traveling further.